PETALING JAYA: It’s back to classes with Ben 10 shoes, Canggih attire and Swan school bags as kids gear up for the new school term next week. While the boy with the watch-like alien device on his wrist will not be trudging the school yard or corridors, his shoes are among the most sought-after brands among eager boys and girls returning to – or starting – school on Monday. Year Two pupil Sean Chan, accompanied by his mother, Ng Guat Kim, bought white Ben 10 canvas shoes, a set of uniform and stationery at Parkson’s Back to School fair at the 1Utama shopping mall here. “He watches the Ben10 cartoon so he asked me to buy him the shoes. “I don’t know if the school allows it, but he said they do,” said Ng, a clerk. Spoilt for choice: (From left) Abigail looking at some lunch boxes with her mother Gloria and sister Beatrice at the Parkson ‘Back to School’ fair at the 1Utama Shopping Centre in Petaling Jaya yesterday. Cassandra Heng, who will be enrolling in Form One at SMK Bandar Utama Damansara (2), was spotted trying on her light blue pinafore. “I like the Canggih uniforms because of the fabric. Another place had run out of stock but Parkson has them. “I would also like a light blue school bag because I don’t really go for items with cartoons,” said Cassandra, who was a little apprehensive about starting in a new school and leaving old friends behind. “Only five of my ex-classmates will be going to BU (2),” added the former pupil of SJKC Damansara, who went to the mall with her mother, Josephine Loo. Primary schoolgirls Abigail Yap, 10, and six-year-old sister Beatrice, were shopping with their mother and grandmother for their school supplies. “The girls like to choose their own items, such as lunch boxes and stationery, and they are all pink. 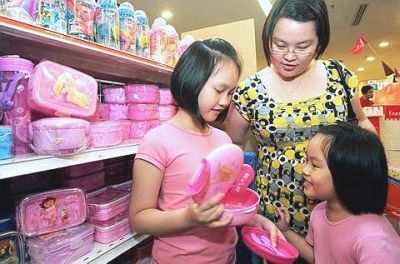 My daughters like the Hello Kitty items but they are very expensive,” said bank officer Gloria Chin. Parkson promoter Mohd Hassannruddin said the fair was popular with children and their parents, who came here for the wide array of back-to-school supplies. “The fair is packed with shoppers, especially on Friday, Saturday and Sunday,” he said.